1. I thank my friend Prof. Joseph Sievers, director of the Cardinal Bea Center for Judaic Studies, organizer of this important course, for the honor of having invited me to speak in this prestigious setting, as well as His Eminence Cardinal Kasper. 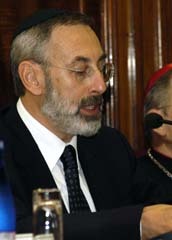 Among the audience, I wish also to greet the delegations of the Vatican Commission for Religious Relations with the Jews and of the Chief Rabbinate of Israels Delegation for Relations with the Catholic Church  delegations that, just in these very days, are getting together for a new encounter at the villa Cavalletti, close to Rome. The work of these two delegations is one of the most indicative signs of the progress made in Jewish-Christian dialogue. Not only because of the presence of official representatives on the part of an Israeli governmental entity; but also and especially because of the involvement of a part of the Orthodox rabbinical world at a level that would have been inconceivable even a few years ago; from the Jewish point of view this is probably one of the most important signs, if not the most important one, of a changed perception of the terms of the problem on the part of the rabbis. The path of our relationship has been marked in these years by ceremonies that have grown ever more numerous, by public acts, declarations, conferences, meetings, publications  but an element of the problem remained always unresolved: the answer of Orthodox Judaism. This problem is still far from its solution; but the participation of some Israeli chief rabbis is a sign of a readiness to listen and to adopt a more trusting attitude for the future. Next to the great official events one ought not to forget those that look like small steps, but perhaps it is from these very small steps, unaccompanied by the hype of the media, that something new shall begin, ultimately blossoming into what shall be the correct relation between Jews and Christians in the medium term and long term. The first open question, which is the topic of this our first meeting, is the definition of who are the parties involved in this dialogue, and who they represent; in the Catholic Church this is clear, in other Christian Churches not yet; among the Jews, the variety of different existing tendencies makes the question even more complex. 2. If someone is thinking that the reluctance of many rabbinical circles to engage in certain forms of dialogue is unjustified or ungenerous, or is surprised at how slowly their reactions come through, such a one fails to understand the fundamental characteristic that defines the relation between Jews and Christians. It is not a relationship among equals, it is not a symmetrical relationship, in the same way as the relationship between father and son cannot be symmetrical, or the relationship between one who is numerically large and one who is small, between those who for centuries were the dominating part and those who for centuries were barely tolerated. And especially it is asymmetrical because of the very essence of the two faiths: for the Christian it is impossible to conceive of a faith which is not rooted in the original faith of Israel, but in which the incarnation breaks through; for Judaism, that incarnation entails a negation of the original faith. For the Christian, the encounter with Judaism entails a rediscovery of the roots of his faith; for the Jew the encounter with Christianity confronts him with something entirely different, grown out of what are effectively his own religious roots. Theologically the Christian cannot do without Israel; the Jew, in his faith, must do without Christ if he does not want to deny his own faith. It is because of this fundamental theological asymmetry, and of all the consequences that it has brought about in the course of history, that the relations between Jews and Christians, as they have developed from the time of the Second Vatican Council, have been, with few exceptions, a great process promoted first and foremost by the Christian Churches, but which has seen the various components of Judaism sometimes skeptical, sometimes reluctant, sometimes collaborating with enthusiasm; but almost always in the role of the invited guest. The Jew Jules Isaac who knocked at the Vaticans door was not a rabbi motivated by the desire to understand the truths of the other religion or to impose his own; he was a historian, who had personally been a victim of an enormous injustice, who asked for the preaching of hatred to stop. Even this was a manifestation of the fundamental asymmetry mentioned above; it was not simply an encounter between the representatives of two worlds in conflict with each other, but the encounter of the persecuted part with the institution that historically continued to show itself as inspiring hostility. Strictly speaking, Jules Isaac was not seeking dialogue as it would later develop (and as he anyhow already anticipated), but the end of the teaching of hatred. To this request the Catholic Church, as well as many other Churches with her, has answered with a decisive and ever intensifying commitment to the removal of the teaching of hatred and with an invitation to dialogue and reconciliation. The Church however often did this, inevitably in her own language with her mentality, with her culture and vision of the world, in light of her own exigencies. All this is often different from the Jewish point of view  or indeed from the many different Jewish points of view that exist in the present world. For this reason the dialogue between Jews and Christians, which was a historical turning point of the end of the millennium, must still go through and experiment with all the complexities of difference and asymmetry. It is necessary to understand that every step of the dialogue, from the definitions of the agendas and the goals, to the ceremonial aspects of the great public events (which are of no minor importance in a society dominated by the mass media), must be based on shared rules. It is necessary to decide clearly in advance where we want to arrive and how we want to proceed. Otherwise, instead of solving the problems, the result is to cause further tension, resistance, and exclusion. The example of your two commissions that are working at present does in some way go in the opposite direction, showing the good fruits that can be attained through readiness to listen and through having previously spelled out the limits and objectives of dialogue.  says the document. This is in some way a reprise of the old theme of the verus Israel, which in its conciliar formulation leaves open the problem whether the existence of a new people of God means that the old one can no longer be considered as such, or whether the old and the new people are both called to play a role in the history of salvation. Cardinal Bea, who courageously defended this conciliar document, and whose name this centre bears, had no doubts on this matter. He once explained that of course it is true that the Jewish people is no longer the people of God in the sense of being an institution of salvation for humanity. Of course from that time the thought of the Church has evolved and become more nuanced. Some claim that there is now clarity, or sufficient clarity, or at least a lively dialectic between the different positions which therefore makes dialogue possible; others underscore instead that in the Church there is an effective prevalence of more rigorist positions and from this they argue that an atmosphere of real trust is lacking and thus a sincere dialogue cannot take place; a third group argues that it is impossible to ask of the Church that she change what is after all her essence, and thus that dialogue must avoid addressing all these questions. A famous rabbi of our times, and a descendant of illustrious dynasties of Chassidic masters, and one of the first to become personally involved in Jewish-Christian dialogue (I am talking of Abraham Joshua Heschel), claimed that the Churchs faith in Jesus makes Judaism incomplete; if this faith is denied, Christianity is false. There is no dialogue on this point. According to this point of view, dialogue ought not to touch the principles of faith. And it does not even have to touch the principles of religious self-consciousness, the way in which the community of faith defines its relationship with God, unless this self-consciousness encompasses within itself any aggressive attitude towards others. The problem that Jewish observers raise concerning the evolution of Christian theology is not that of principles, which are not to be discussed, but the aggressive potential that can be hidden under these principles. How is it possible to preach dialogue in a context of respect for each others identity (both ones own, but also and especially the identity of our interlocutor), when contrasting  and alarming  signs are sent out at the same time? Or, more clearly and directly: the Jew who converts to Christianity, is s/he a model of dialogue or its negation? For example, the massive ecclesiastical efforts that took place around the beatification, and later the canonization process of Edith Stein show us a Church that still proposes as a model of heroic virtues the converted Jew (or Jewess), and sanctifies the image of the latter even to the point of using the expression (which for us is profoundly disturbing) of a new Esther. To refer to another, even more recent example, a prestigious Catholic publishing house has published the autobiography of a controversial Chief Rabbi of Rome, who converted to Catholicism in 1945, and was prepared for baptism by a small group of important prelates connected to this University, among whom was also Augustine Bea. The publication of this work has been accompanied by a lively marketing campaign on the part of the Catholic media, as well as by highly appreciative reviews in both the specialized and the general press. On the part of an important journalist there has even been a proposal to put forth the former rabbi as a candidate for beatification. What I wish to stress is that, 39 years after Nostra Aetate and 30 years after the Commission, I believe I have not come across (and I would be glad if anyone were to correct me on this point) a single article by a Catholic author, where it was said that the times have changed, and that a rabbi who converts to Christianity is no longer an aim of and an ideal for the Catholic Church. 4. Another critical point for dialogue is the contradiction between the many results obtained and the fragility of what we have achieved. One of the first necessities was to change radically the didactic of anti-Jewish hostility, and especially to eliminate the charge of deicide. We must of course acknowledge that the Church has worked very hard to favor a different presentation of the Jewish people as well as a new climate [of reciprocal understanding]. Together with many other Jews I am a daily witness of this changed climate, of this respect that goes deeper than the surface, of an attitude of esteem, admiration and affection towards the Jews that is obviously derived from a different type of religious education. It is certainly a process that requires time and patience, and thus we are still far from the ideal; though occasionally doubts arise as to whether this ideal is really a priority. I cannot cancel my memories of what happened a few months ago, when controversy raged around the passion  I mean the one represented in a movie. I certainly do not want to go back and discuss that movie again. What is necessary to reflect upon is the reaction of the Church and of the Vatican at the time of the polemic. While Cardinal Kasper avoiding comment on the movie directly declared in an interview that this was a good occasion to reaffirm the recent teachings of the Church, the reactions and rumors that were spreading in other official contexts were certainly quite different. The sad impression that the Jewish world received from all this is that when confronted with strong mystical experiences and huge interests of a pastoral nature, but also of other types, the problem of the correct relationship with the Jews seems to be the last thing to worry the Church, which then thinks that a generic reference to the official documents (contradicted by the facts) is sufficient to patch up the damage. In line with what was said by Cardinal Kasper, this could be a good occasion not only to reaffirm the teachings of the Church, but also to reflect on the meaning that they really have in moments of crisis. 5. Moving on from what one hopes to have been an isolated incident to a reflection on more fundamental issues, I believe it is no longer possible to avoid some radical implications of dialogue. Even if we still have to overcome a number of basic hurdles, such as the fight against anti-Semitism, the climate of the dialogue is now very different; it is more mature and it confronts us with difficult choices. There is the question of the limit, of the sense of the absolute and the relative, of what we can ask from the other without offending him or compromising his integrity, but without being forced to compromise on principles. Theology and law, which is what we call halakha, have their own inner rules that determine how they are shaped and how they evolve, and they are only tangentially touched upon by contingent reality, no matter how important is the latter. Thus dialogue should not, or effectively could not, directly influence their development. And then there is the question of truth. Do any of us possess the whole truth, or only a part? This is a decisive question. Because if each of us possesses only a part of the truth, then by coming together we would possess more of it. I do not know whether this would be a fruitful option for Christianity. Certainly, for Judaism, it would amount to its end. So, again, we are confronted with the asymmetry of our encounter and of our dialogue. In any case there must be limits, both in what we can expect [from our interlocutors] and in our readiness to accommodate [opinions different from ours]; and there must be spaces of freedom so as to think of our faiths in a way that is neither arrogant nor aggressive, but that remains always strong and without compromises. Dialogue can follow the rules of diplomatic courtesy, but it is not a diplomatic negotiations based on reciprocal concessions. A risk that is always on the horizon is that of proposing the simplified image of a universal religion, or of a sort of U.N. of the religions where all the faiths are the same. I have in mind the results of a recent survey (Piepoli Institute, 09/19/2004) on the religious beliefs of the inhabitants of the city of Rome, in which 48% of the people who were interviewed was of the opinion that the religions are all more or less equivalent. It is not only ignorance; it is the consequence of a (today very common) oversimplifying attitude that confuses respect for the dignity of everyone and for the differences of opinion with the intrinsic value that one is to give to ones own convictions. This is a reality that ought to worry all religious interlocutors, because it evidences a relativism that has already been denounced and condemned many times. But more than everything else, [this attitude] worries us, because a general weakening of the religious sense works to the disadvantage of the numerically weaker part. In the course of history, as at the end of the 15th century in Spain, we have paid a harsh price for this. Another risk is that, if one only thinks in terms of numerical preponderance, the minorities are merely considered as some curious small variants, so that the voice of the majority can speak for all. But inter-religious dialogue does not follow the rules of democratic co-existence. In politics and in ethics we can and we must fight together for the sake of common values, but we should not lose awareness of our identity when our opinions differ. We have not for instance supported the insistent Catholic request that the European Constitution refers to Judeo-Christian roots, since it is not by inserting a hyphen between Judaic and Christian that we solve the problem of what we have in common and what we can give to others; and even because, remembering our own history, we could not forget that the Jews have often had to taste the bitter fruits of those Christian roots. It would have been much more useful to organize a preliminary dialogue between the two worlds [of Jews and Christians] on this theme. I believe that if we fight together for the sake of something, in the conviction that everyone has a particular role to play, without being merely dragged in by the other, our strength towards the world becomes enormous. In the field of ethics, and of bio-ethics in particular, we cannot reduce everything to a common vision. The differences that exist between us, for instance as far as stem cells are concerned, in the greatest majority of cases do not allow us to form a common front; but it is exactly here, in relation to a problem that is never discussed in the context of our dialogue, that dialogue ought to help us clarify the issue, and to work together for the formulation of a law that respects differences of opinions and that is not merely the expression of a numerically strong majority. 6. Let us come to a few conclusions. If one looks at the program of this course, where the Christian theology of Judaism is mentioned repeatedly, one can see another asymmetry. There is never any reference to the Jewish theology of Christianity. But this theology, does it exist? Of course it exists. And over the past years, has there been any breakthrough in this type of theological reflection? Of course there have been breakthroughs, as in the past, though they have not necessarily paralleled those of Christian theology. These breakthroughs have been much slower, and much more dialectical. At the moment of their re-encounter, when Esau invited Jacob to travel together, the patriarch Jacob answered his elder brother that he needed time, that he would follow in his own time, according to his own rhythms (Gen. 33, 14). Israel answers in the same way. The dialogue, which does not have to be theological, inevitably confronts Israel with the theological question of how to define the other. This is a problem that shall have to be solved from the inside, on the basis of the inner dynamics [that characterize Judaism], outside the context of inter-religious dialogue; but it is a problem which Israel, in its own time, shall have to face. In Judaism, however, theology (a term absent from its classical vocabulary) cannot be detached from halakha, the law, which is much more important and binding. In the past centuries the harshness of the attitudes towards the Jewish community did in some way make it easier to embrace certain radical stances of opposition. The rules that we have inherited were formulated in different times and places and reflect contrasting opinions as to the role of Christianity, the nature of its beliefs, the risks of dialogue, the possible limits and the way in which certain concessions can be justified. It is necessary that today even on these themes halakha has again to take up its guiding role and determine how we are to behave, re-opening the discussion and putting forth the answers. But halakha has its own rules, and the results cannot be programmed in advance on the basis of political expediency. 7. At the level of doctrine, we can allow ourselves a greater margin of freedom. Certainly, on the basis of the texts, there are itineraries that we can choose, if with some caution, to undertake new doctrinal reflections. I want to propose two, rich in symbolic interpretations. First, the Prophet Isaiah (49:14) reported Zions lament: Zion says: the Lord has forsaken me, the Lord has forgotten me. The answer to the lament is a consolation: there is no abandonment, nor oblivion, because God is for Israel like a mother, in fact even more than a mother who does not abandon her little one. A Master of the Talmud (TB Berakhot 32b) asked why there are two words in the lament: abandonment and oblivion; he then explained: it is like a man who has abandoned the first wife for another, and has forgotten the first. It is an odd explanation that somehow contradicts what comes afterwards [in the text], where the symbolic relations are those between mother and son and not those between husband and wife. It still remains an interesting image, however (though perhaps women nowadays will find it mildly disturbing): in the same way as a man can have more than one wife, establishing a special affective relationship with each one of them, so God can unite Himself to different peoples, after having been united to Israel that was his first companion. There is no limit to the divine love; but still, we must decide whether at every new union the previous companion has been repudiated and neglected forever, or whether she remains forever loved; and the prophetic text seems to support the second hypothesis; though in the end this rabbinical reflection does not exclude the possibility of non-exclusive affections for God. And with some irony we could imagine that, in the same way as it often happens in polygamic families after the initial rivalries between the different wives, the latter might decide to form an alliance to control or to resist the husband. It would be an unforeseen and paradoxical historical evolution. The second possibility: in Genesis 27, 45, we are told that when Esau threatened to kill his brother Jacob as soon as their father Isaac was dead, their mother Rebekah ordered Jacob to flee, saying: why should I be deprived of both of you on the same day?. The two could be Isaac and Jacob, or, according to the rabbis, Jacob and Esau, the latter perhaps having been condemned for his crime. Rashi, taking up an idea from the Talmud (TB Sota 13a), says that at that moment Rebekah had been vouchsafed a spirit of prophecy, and had intuited  so deduces the midrash on the basis of the biblical narrative  that effectively, many years later, the two twin brothers would die (or would be buried) on the same day. The words of Rashi let us think of another important matter: of the two brothers, there is not one who shall disappear before the other, maybe being swallowed by the other. We are destined to remain forever together, in good as well as in bad fortune, and as long as either of us lives, the other shall live as well. Let us always remember this perspective, and let us try to transform the destiny of our forced co-existence into an invitation to positive, and not destructive confrontation, as well as to beneficent growth for us and for all of humanity. At this crucial moment in human history, when those who in a sense we were used to consider the descendants of Esau are putting back into the sheath the sword prepared for Israel, and when the descendants of Ishmael are taking it up again after centuries of relative calm, the sense of our human origins and of our responsibilities must prevail [over all other considerations]; echoing the words of the prayer of Isaiah (64:7): Now, O Lord, you are our Father; we are the clay and you are our creator; and we are all a work of Your hands. The Jewish people in the divine plan of salvation, Civiltà Cattolica 1965, IV, pp. 209-229, reprinted in L. Sestieri, G. Cereti, The Christian Churches and Judaism, 1947-1982, Marietti, Casale Monferrato 1983, p. 95. Cardinal Ratzinger appears to follow this point of view when he claims that in the Old Testament [the people of God] was the people of Israel, from Christ onwards the new people is that of his disciples (Il Tempo, 02/27/2004, p. 7). As provocatively suggested by Rabbi Jonathan Rosenblum in Jerusalem Post, 01/01/2004.